Beyond simple real-estate branding, the spectacular renders of Egypt’s new, tabula-rasa capital are a visual reproduction of the country’s regime. Six months after an extravagant announcement, the government’s plans to establish a new Egyptian capital city seem to be caught somewhere between controversy and awkward silence. The influx of conflicting reports about cancellation, technical obstacles, financial problems and decommissioning briefly stopped after a gag order, but resumed shortly thereafter with official statement about commencing the project by the end of October 2015. Despite the negative critique that swarmed professional circles and social media before the media blackout, and despite the historically recurring failure of the new cities scheme in general, the Egyptian government is still publicising the project with an air of positivity. The official presentation of the new city during the Egypt Economic Development Conferencelast March featured photoshopped maps of Egypt with a huge green terrain covering what’s now the Western Desert, showing “how Egypt in the 22nd century would look like,” Housing Minister Mostafa Madbouli said. He further explained that the new city is only a part of a bigger “national strategic plan” that combines on a single map all of the new cities that were built since the late 1970s, other mega-projects that are currently underway in Toshka, the Western Desert, and more importantly, in the Suez Canal Zone, in addition to the new capital city, together forming one big integrated network of development spanning the whole map of Egypt. 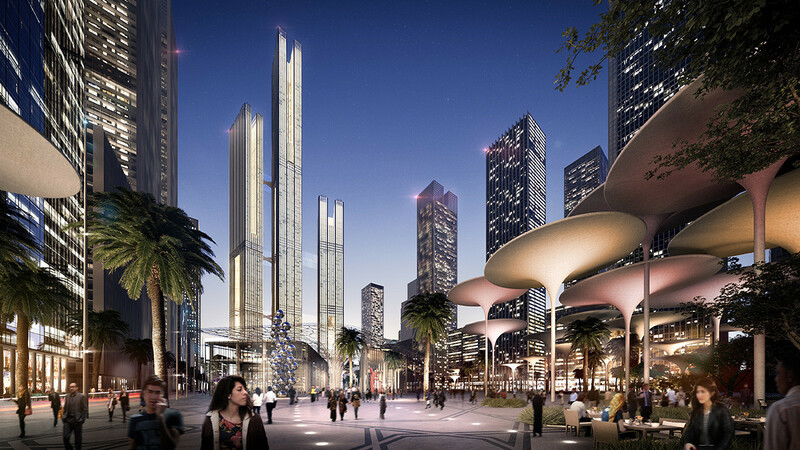 Visualisation of the new Egyptian Capital. 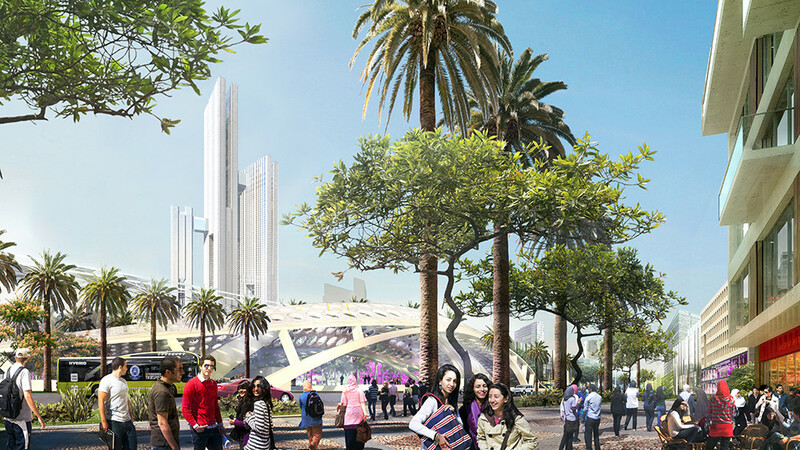 This was accompanied by other architectural visualizations, stock images and videos suggesting daily scenes from the new city with green promenades, Dubai-esque architecture in the background, and young people strolling by in the foreground. 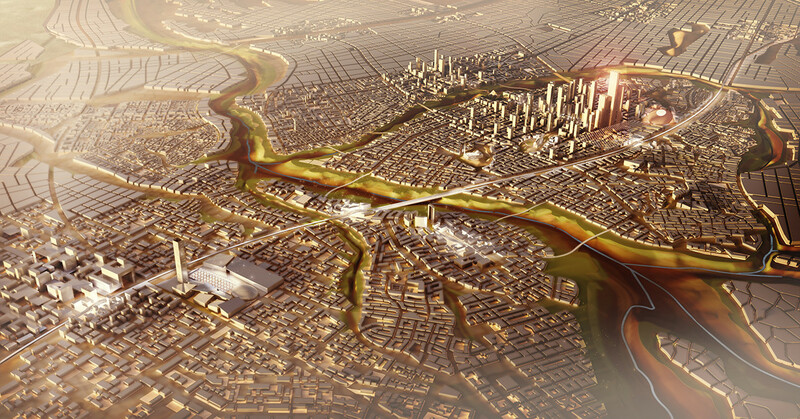 Visualisations of the new Egyptian Capital. The maps and images had such a make-believe effect that the value of properties located within several dozen kilometers of the proposed city spiked out of proportion just a few minutes after the press release was issued. Discussions about the pros and cons of living in high-rise buildings and possibilities of pre-booking suddenly surfaced in talk shows. The average public was plugged into discussing details of life in the new city — a city that is still just an image. The audience’s immediate response collapsed the experience of the image with real space-time. The answer lies in the means used to produce these visuals. Using a set of techniques verging the fields of photography, 3D graphics and cinematic VFX, architects are capable of producing ultra-real visualizations of buildings, streets, trees, cars, people and skies cut out from their original contexts, and collaged together to form whole environments. These populations of pixels — as in the case of the new Egyptian capital — inspire not only a design, but a whole world. Being mere pixels, these collages are inexact, incongruent and unrepresentative of the real world. Nevertheless, they are used to discuss designs, negotiate contracts, buy and sell property, and even constitute legal documents in the real world. By fully depicting the world-to-be to the tiniest detail, these images assume control over the immediate world — hence, they become material in and of themselves. In this case, the sheer scale of the maps combined with the images’ minute details of everyday life speaks of an authority that has absolute control over this promised world. Such an authority has to remain external to our world — much like a modernist architect, it has to see it from a distance, as an image subject to comprehensive reorganization. This graphical mode of drawing/designing a new Egypt in a comprehensive fashion finds its root in classical, late-19th century urban theory, and in Boris Groys’ notion of the artist-ruler. The art historian theorizes the Communist Party of Stalinist Russia as an artist whose material was Russia itself, and whose goal was to reshape it in ideal form. This mode of ruling cultivates a positivist attitude that conflates social engineering with spatial planning, and advocates a heroic vision of what the city and society must one day become — largely via the aid of concepts, drawings, maps and images. The object of these visions — the whole of society itself — is inert matter that can only find purpose and meaning through an image, a plan, or a concept laid out by the hands of the artist-ruler. But to be more specific, the practice of thinking through images as substitute realities falls more precisely under what political theorist and historian Timothy Mitchell calls representation. In this context, representation doesn’t refer to the mere making of images or mental references. Instead, Mitchell’s representation is a social practice that establishes an image authority over reality, where the reality of the real is always a function of an image. In this sense, adding green to a yellow patch on the map or visualizing imaginary worlds is not simply an act of creating visual references. It’s an act of bestowing meaning and existence on a visual depiction. Through representation, the imaginary world visualized in these images becomes even more knowable and discussable than the real world. Some would ask, so what? Isn’t building such a dream world a good thing? 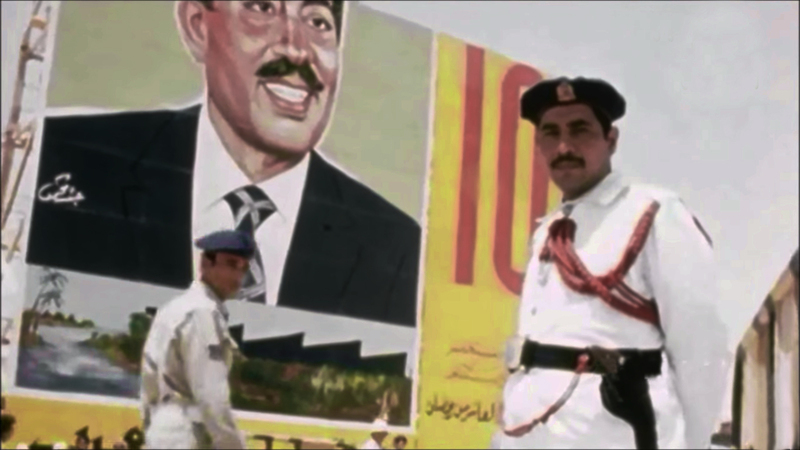 A still from National TV news reel 1977 documenting the inauguration ceremony of the 10th of Ramadan City – The Image shows two policemen guarding a poster of former president Anwar Sadat with depiction of factories, greenery and waterways. These new cities were similarly planned side-by-side with massive infrastructure projects — and, of course, massive forced evictions where needed — and were supposed to reinvent social, spatial and demographic realities into the shape of a dream world. However, this dream world fell bleakly short of its promises. New cities failed to achieve any substantial economic development, mobilize any positive social change, or even meet a tiny fraction of their planned target populations. In short, unlike the image, the reality of the promised world turned out to be so gloomy that many preferred to stay in their old worlds. So why would the government repeat the same mistake? David Sims’ latest book, Egypt’s Desert Dreams: Development or Disaster?, portrays the Egyptian government as an entity so complex, yet so inefficient, that it prefers to repeat the same pattern of mistakes and encounter expected problems than to try something else and risk new difficulties — hence the frequency of grand planning schemes that never work. This argument runs the risk of falsely flattening the different administrations of the last half century into one single entity, but it can still be of good use when considering the case of the new capital city. If we can entertain the assumption that, deep inside the imaginary inner-self of the Egyptian government, there is a stable paradigm where these grand schemes still make sense despite all the past failures, we would start to glimpse the metaphysical framework that governs spatial planning in Egypt. It is this blind belief in drawings that makes up the matter of this ethos. The statement reflects a sense of religiosity that elevates failing cities into some sort of a disciplinary practice, rather than a recurring mistake — a practice of ruling through drawing. From the authority’s viewpoint, the real world is an image that needs to be aesthetically reconstructed or improved, and the imaginary world promised in images is more vivid and true than the one that is to be replaced. Drawings for this NUCA official must have been more material, immediate and meaningful than reality itself. The continuous act of drawing the world-to-be is the way in which authority sustains a stable worldview, in which it places itself as external to the world it intends to change, and rule. The object of this vision, the thing that is looked at, seems to be lacking a self of its own — it is, in fact, an image. Another sense of graphicness is also noted in Salah El-Shakhs’ discussion of Sadat City’s failure as an administrative capital. The now-abolished Ministry of Development and New Communities planned to move administrative functions to the new capital, but refused to relocate itself. The hand that drew the plan can move things, but cannot be moved. It stays outside the plan. This regime of graphics isn’t solely a remnant of modernity. Historically, Egypt’s urban mass is a man-made network of infrastructural ventures developed over centuries of precarious dependence on the Nile as a sole source for water. This situation renders futile any attempt at projecting politics on the territorial space without a parallel reanimation of infrastructure. Egypt’s history could be a history of hydraulic engineering. This makes Egypt a constantly evolving architectural project — an endless series of drawings in the strict architectural sense. Consequently, if the crux of the nationalistic project in Egypt was to establish a comprehensive sense of order spanning the country’s physical and non-physical space, then this order must be of a graphical nature. This order is expressed in a visual form. Text : Most Egyptians are fed up with Sisi's Dream Projects which they call FANKOOSH or Canard like the New Egyptian Capital.